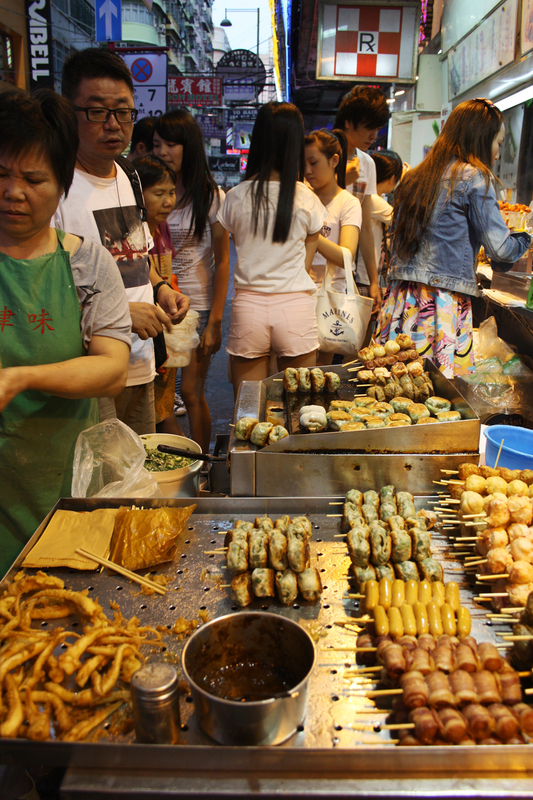 This lady (lower left) is truly a champ, as she runs one of my favorite street food stands near the Ladies Market in Mongkok and WITHIN that stand makes one of my favorite little numnums in Hong Kong, pan-fried chive dumplings. They are perfect every time. These things are very yummy indeed. Chives are chopped up and seasoned. Some sticky substance (maybe egg white?) 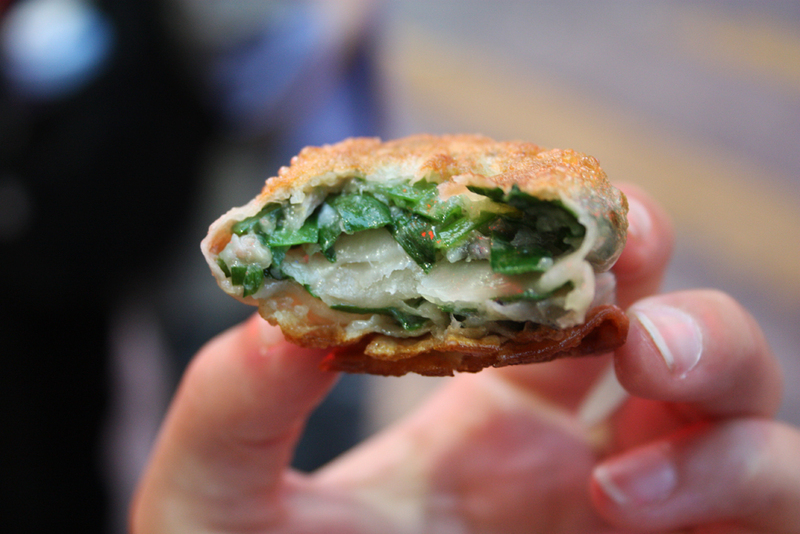 holds the thing together and makes it into an easy-to-scoop, dense filling which is stuffed into a little pocket made by folding a sheet of dumpling dough over itself. 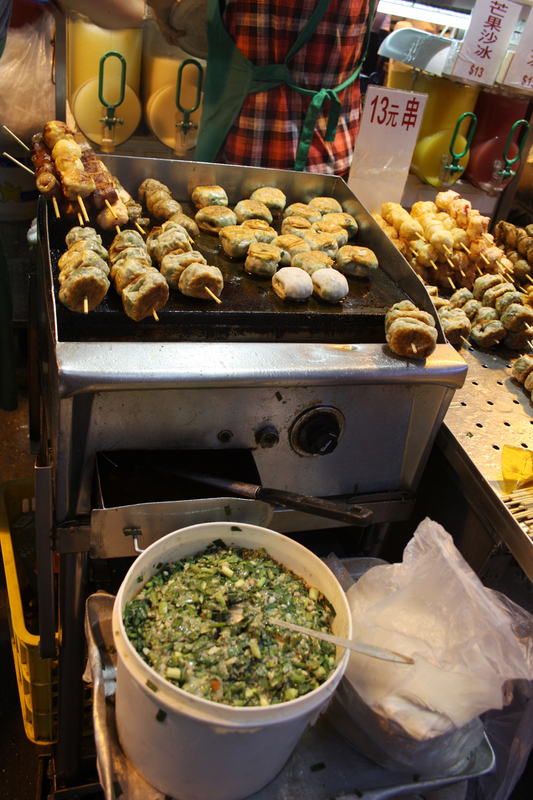 The thing is then grilled in skewer form to cook whatever that protein-rich goop holding the green stuff together is. 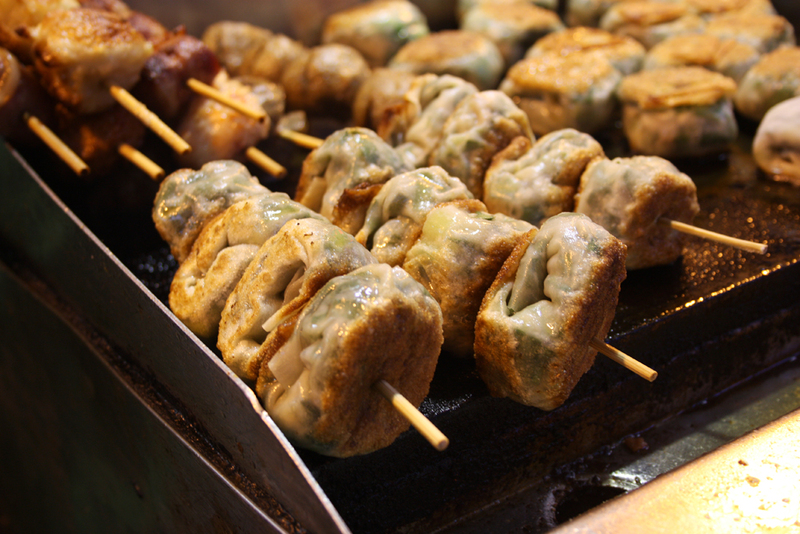 They cost around 12 HKD (1.50 USD) for 6 of them and they are incredibly warm, filling, and delicious. A choice of 3-4 sauces is also available in case additional flavor is required. They please. The outer layer of the of the dough is seared on an oiled, hot, metal surface and becomes a nice and crispy, golden sheet on either side of the dumpling. The interior of the dough, especially the folded layer inside of the thing, remains a bit chewy, with a bite to it. The filling is creamy, moist and dense and it makes the wrapper bulge out like a fat, smooth little baby belly, impossible not to bite into. The flavor is not particularly exciting but pleasantly onion-y, which is enough for me. Adding a bit of hoisin sauce brings a sweetness as well as a very subtle marine element to the bite, echoing a shrimp and chive or scallop and chive dumpling. Adding soy sauce brings out the natural sweetness of the chives within. Adding a chili sauce gives it a punch of heat which takes over the flavor and makes the dumpling more of a textural component. Hot, delicious, comforting. A snack you can bring home to mom.